The grooming parlour was completed in December 2004. This room is a bespoke design. It is light and airy and the dogs feel relaxed in this happy environment. Central heated via the biomass boiler. 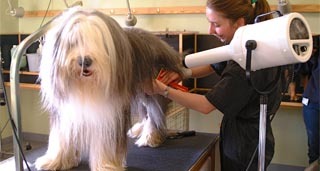 Dannii is a City and Guilds professional dog groomer. She runs her business Pawfection Dog Grooming from our onsite parlour. She has lots of experience with different types of dog breeds. So if you would like your dog to be groomed whilst they stay here at our boarding kennels, whatever the breed, your dog will look and smell great. Short haired dogs i.e. Labradors, Collies etc.. benefit too; a bath and blow dry strips any dead hair out, minimising hair loss for weeks. 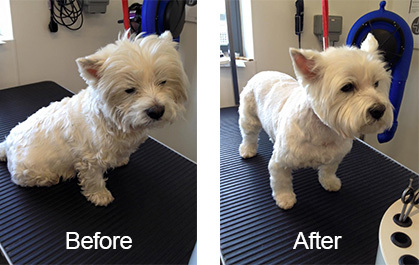 Alternatively if your dog just needs a groom and doesn't need to stay, call Dannii on 07858909344 . Check out her facebook page for up to date pictures of her grooms and more information. De-matting blunts tools and is very costly to the business. This can be done separately or as an additional charge to full grooms.